Bwindi Impenetrable National Park in Uganda is one of the best National Park where you can find the endangered mountain gorillas. 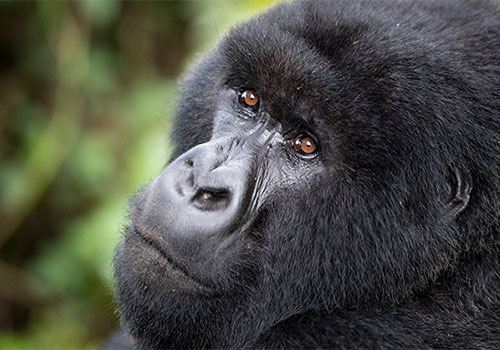 Therefore in order to have a chance to encounter with these gorillas, as a tourist, you have to book your gorilla trekking permit in a period of three months before your trek and you will as well have to book your Gorilla trekking Safaris to Uganda. In order to book, you have to contact the Uganda Wildlife Authority or get in touch with a particular tour or safari company to organize your gorilla trekking permit that qualifies you to go for gorilla trekking. However, tourists should note that only a maximum of eight people are allowed to trek a particular gorilla family and the age limit starts from 15 years therefore no one below fifteen years of age is allowed for gorilla trekking. Mountain Gorilla tracking in Bwindi is done in the four regions in Bwindi National Park and these include; Ruhiija, Buhoma, Nkuringo and Rushaga gorilla tracking areas. However, Buhoma and Nkuringo regions in the south of Bwindi are the only authorized sectors for Gorilla trekking. The most famous gorilla trekking sector in Bwindi Impenetrable National Park is Buhoma and it was the first to be established for gorilla trekking under the Uganda Wildlife Authority. Buhoma region has well developed trails making your trek through the forest much easier and interesting and as you search for these gorillas, you are accompanied by beautiful views of various bird species and primates within the forest. And right after the trek, visitors are taken to Buhoma community walk to enjoy the wonderful cultural activities that they will encounter in this community such as cultural performances in songs and dances, meeting the traditional healer and other activities such as craft making hence leaving you with a memorable experience at Bwindi Impenetrable National Park. Nkuringo region is also another interesting area for gorilla tracking. It’s located in the South west of Bwindi just next to Buhoma. Here, as you trek through the forest in search of these gorillas, you will be able to encounter with habituated gorilla families such as Orozogo, Kyaguriro, and Bitukura habituated gorilla families and as you trek through the forest you will also be able to view beautiful bird species as well as various primates making your gorilla tracking experience very memorable.